The 5th Annual Chinese Restaurant Awards celebrated the achievements of Greater Vancouver and Greater Toronto’s Chinese culinary elites at River Rock Show Theatre, Richmond, B.C. Attended by the industry’s professionals, media, and VIPs, the Oscar- style award ceremony was hosted by Breakfast Television’s Dawn Chubai and OMNI Television’s Sunny Chiu. A full list of the award winners, description of judges’ bios and a link to photos from the event, are available below. The presentation opened with a dazzling tasting reception, which included live cooking demonstrations by Vancouver-based Chef Andy Liu of Sea Harbor Seafood Restaurant, Chef Wing Ho of Fortune House Seafood Restaurant, and Chef Hung Ching-Lung, founder of Chef Hung Taiwanese Beef Noodle. Chef Hung, who travelled from Taiwan especially for the ceremony, gave a riveting noodle- making performance that delighted guests including Consul Li Yue of Overseas Chinese Affairs at the Consulate-General of the People’s Republic of China in Vancouver. During his speech, Consul Li praised the growing success and contribution of both the Awards and the chefs. Greater Toronto, another bustling hub for Chinese food, was selected to be part of the Awards as a result. Four locally acclaimed food critics and writers—Jen Chan, Jennifer Kwan, Renée S. Suen, and Charles Yu—were invited to search for ten Critics’ Choice Signature Dishes. Their expertise and experience with different media outlets, such as Chowhound, Yelp, and Toronto Star, are invaluable in developing a reliable new dining guide. One of their notable choices is Richmond Hill’s Omei Restaurant. The winner enticed the judges with their different cooking methods used in Lobster Five Ways (Steamed, Stir-fried with Maggie Sauce, Deep Fried Lobster Legs, Steamed Egg Custard with Lobster Brain, Fried Rice with Lobster Brain). In Greater Vancouver, the Awards’ legacy continued with seven judges voting for the best dishes after a full year of tasting. The results, audited by Pricewaterhouse Coopers LLP, highlight the diversity and popularity of Chinese regional cuisines in the area. Top Shanghai Cuisine’s Pan Fried Shanghainese Buns, a 2013 Diners’ Choice Awards winner, is also voted as a must-eat by the judges. Kirin Restaurant at City Square wowed the judges with three dishes—Deep Fried Boneless Chicken with Minced Prawn, Glutinous Rice, and Chestnut Paste, Geoduck Two Ways, and Smoked Live Lobster with Assorted Mushroom—making them a top winner in the category. 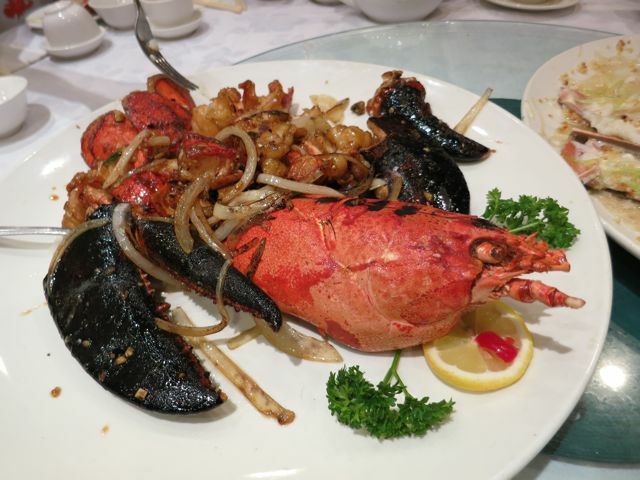 The new title, Greater Vancouver’s Critics’ Choice Awards – Most Awarded Chinese Restaurant, is bestowed upon Sea Harbour Seafood Restaurant. From 2009-2013, the restaurant won eight Critics’ Choice Awards with Signature Dishes such as Fried Squab (2009-2012) and Pan-fried Spot Prawns with Soy Sauce (2011-2012). Adding to the excitement of 2013 is the new Chinese Master Chefs (CMC) program. After five years of planning, the Awards selected Raymond Cheung (Landmark Hotpot House), Wing Ho (Fortune House Seafood Restaurant), Andy Liu (Sea Harbour Seafood Restaurant), Wing Leung (Shiang Garden Seafood Restaurant), Tong Luk (The Jade Seafood Restaurant), Timmy Tsui (Big Chef Restaurant), Tony Wu (Tin Tin Seafood Harbour) and Ming Yeung (Bamboo Grove) as Master Chefs based on their winning records, worldwide reputation, and continuous contribution to Greater Vancouver’s culinary landscape. Their relentless effort in defining Chinese cuisine with innovative ideas has inspired a new generation of chefs and connected the Chinese community with other cultures. The CMC program wishes to share the Masters’ Signature Dishes recipes with the public on Chinese Master Chefs. A 90sec cooking demonstration of each chef’s selected creations will be aired in March and April on OMNI Television’s Cantonese and Mandarin news. All ingredients used in the recipes such as Alberta beef, Alberta Pork and B.C. seafood are available at Vancouver’s PriceSmart Foods—Chinese Master Chefs’ preferred store for fresh and affordable ingredients. The public is encouraged to experience the Master Chefs’ creations at their restaurants and participate in a charitable test drive at one of the three Dueck Auto Group’s locations (Terminal Avenue, Marine Drive, and Richmond in Vancouver). By simply presenting the test-drive card received from the restaurants, diners can help raise funds for Vancouver Community College’s prestigious Conrad Leung Award. For each test drive, Dueck Auto Group will donate $25 to the scholarship program that recognizes the achievement of an outstanding student in the Asian Culinary Arts Program. This entry was posted in Chinese Restaurant Awards and tagged Alberta beef, Alberta Beef Producers, Alberta Canola Producers Commission, Alberta Pork, Amoy Food limited, Anchor Foods International Limited, AX3Battery.com, B.C., Big House Wines, Chef Hung, China UnionPay, Chinese Restaurants Awards, Chowhound, City365.ca, CityTV, Foodspotting, FortisBC, Heineken, Hennessy, New Home Living, OMNI BC, Richmond, Richmond Review, River Rock Casino Resort, River Rock Show Theatre, Sea Harbour Seafood Restaurant, Toronto Star, Underwater Harvesters’ Association, Westca.com, Westender, Yelp, Yelp.ca on March 1, 2013 by press.